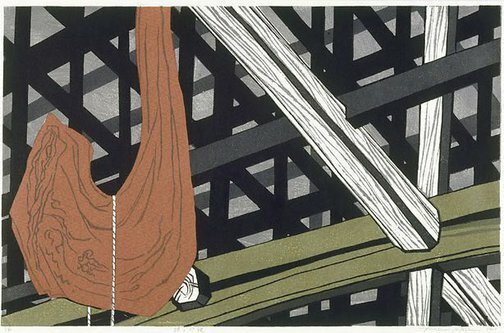 Kitaoka was born in Tokyo and was educated at the Tokyo University of Fine Arts and Music where he studied woodblock printing under Un'ichi Hiratsuka ( 1895-?). He is one of the more senior artists in this exhibition. After the Second World War and a stint in Manchuria he furthered his study under Onchi of the 'sosaku hanga' movement, becoming more interested in an art of pure colour and form. From the 1950s Kitaoka travelled and exhibited extensively. This print is a fine example of his oeuvre, demonstrating his mastery of the traditional woodblock techniques, and his fine sense of colour and pattern. He created this print after visiting an old farmhouse in Takayama where he was moved by the strength and beauty of the wooden ceiling beams, and taken with the traditional structural beauty of the hanger for the kettle hook ('jizai-gake') which was used to hang the perennial iron pot over the open hearth that was the centre of the Japanese rural home. Kitaoka takes pleasure in contrasting the geometrical structure of the ascending beams with the roughly hewn curve of the kettle hook. Signed and dated l.r., pencil "Fumio Kitaoka 1991".